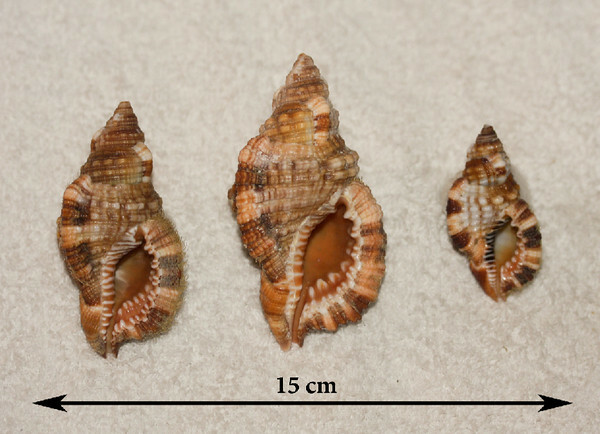 These specimens were collected on the Island of Maui, Hawaiian Islands. The taxonomic names (i.e., genus and species names) are as accurate and current as possible; my sources of taxonomic and zoological information include university- and museum-sponsored websites, as well as those of reputable private collectors. Intermediate Hairy Tritons (Monoplex intermedius; synonym: Cymatium pileare), aperatural views. Collected January-February 2013, Ma'alaea Bay (intertidal zone), Maui County, Hawaii. 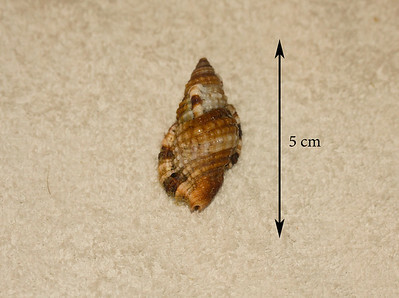 Note the fine "hairs" (the periostracum, proteinaceous outer sheath of molluscan shells) around the outer edge of the aperature of the far left shell. Intermediate Hairy Triton (Monoplex intermedius; synonym = Cymatium pileare), abaperatural view. Collected 2 August 2012, Ma'alaea Bay (intertidal zone), Maui County, Hawaii. Intermediate Hairy Triton (Monoplex intermedius; synonym: Cymatium pileare), aperatural view. Collected 2 August 2012, Ma'alaea Bay (intertidal zone), Maui County, Hawaii. 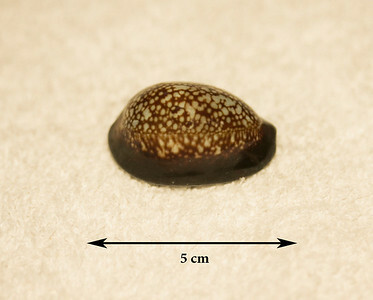 Humpback Cowrie (Mauritia mauritiana; synonyms = Cypraea mauritiana, Cypraea mauritiana calexquina). Dorsal view. 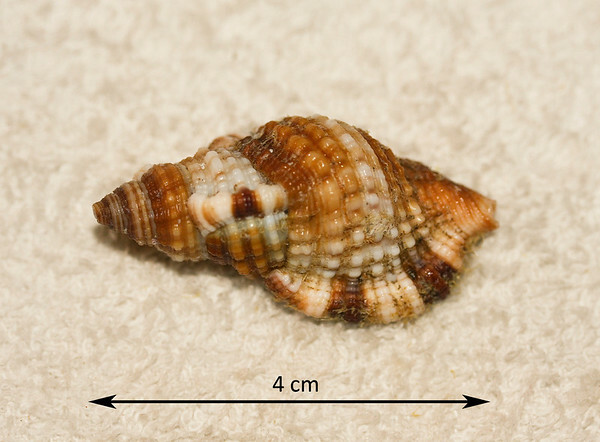 Collected 20 January 2013, Ma'alaea Bay (intertidal zone), Maui County, Hawaii. 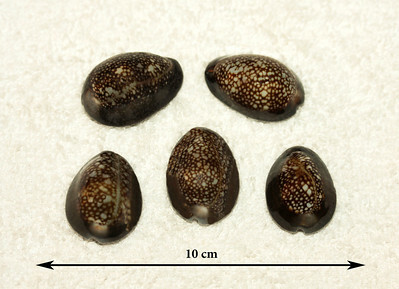 Humpback Cowrie (Mauritia mauritiana; synonyms = Cypraea mauritiana, Cypraea mauritiana calexquina). Ventral view. 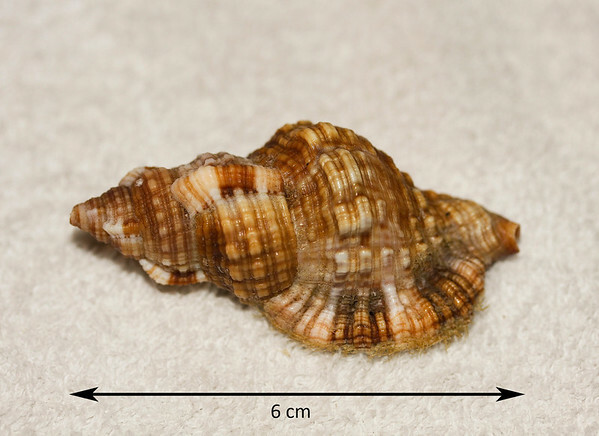 Collected 20 January 2013, Ma'alaea Bay (intertidal zone), Maui County, Hawaii. 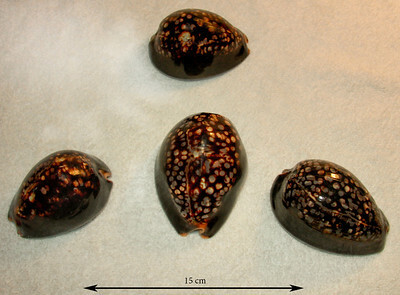 Four of my largest specimens of Humpback Cowrie (Mauritia mauritiana; synonyms = Cypraea mauritiana, Cypraea mauritiana calexquina). Dorsal views. 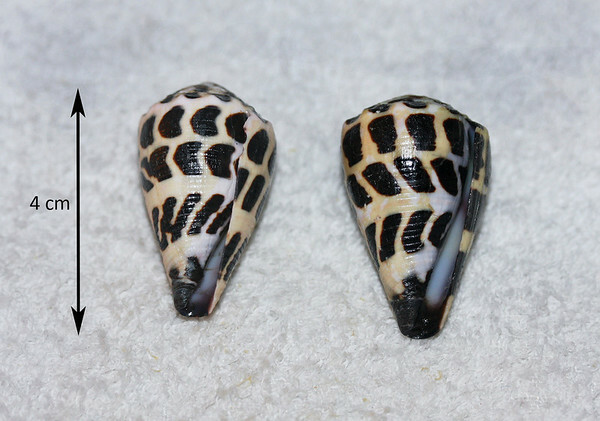 Collected in 2012 & 2013, Ma'alaea Bay, Maui County, Hawaii. 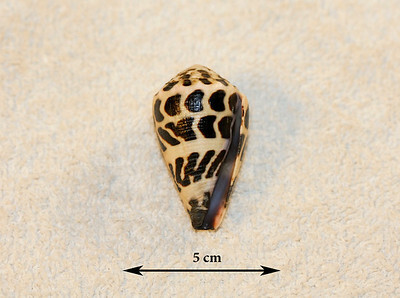 Reticulated (or "Reticulate") Cowrie (Mauritia maculifera; synonyms = Cypraea maculifera, Cypraea reticulata). Dorsal view. Collected 13 December 2012, Ma'alaea Bay (intertidal zone), Maui County, Hawaii. This is the largest of six specimens. 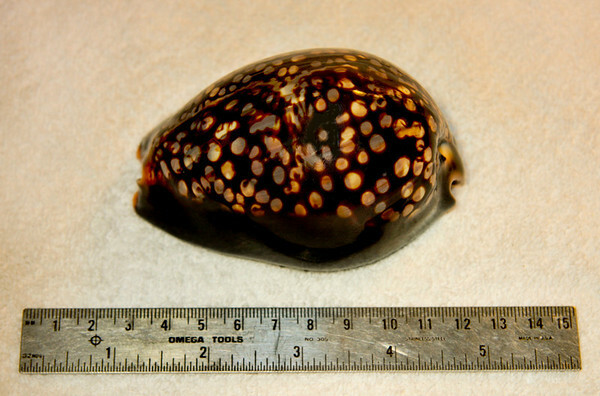 Shares the same surf zone habitat as the Humpback Cowrie. 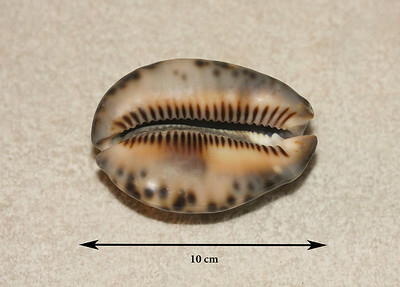 Reticulated (or "Reticulate") Cowrie (Mauritia maculifera; synonyms = Cypraea maculifera, Cypraea reticulata). Ventral view. Collected 13 December 2012, Ma'alaea Bay (intertidal zone), Maui County, Hawaii. This is the largest of six specimens. Shares the same surf zone habitat as the Humpback Cowrie. 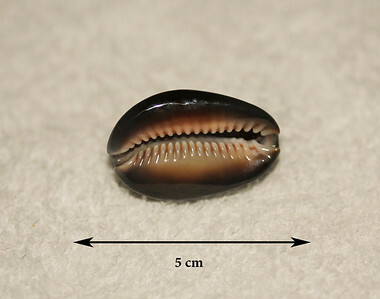 Snakehead Cowries (Cypraea caputserpentis), dorsal view. Collected various dates, 2012-2013; Ma'alaea Bay (intertidal zone), Maui County, Hawaii. Locally very common on the reef platform. 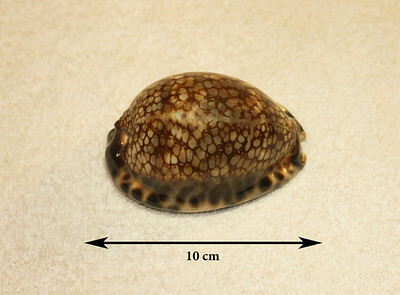 Snakehead Cowrie (Cypraea caputserpentis), dorsal view. Collected 2013; Ma'alaea Bay (intertidal zone), Maui County, Hawaii. Locally very common on the reef platform. 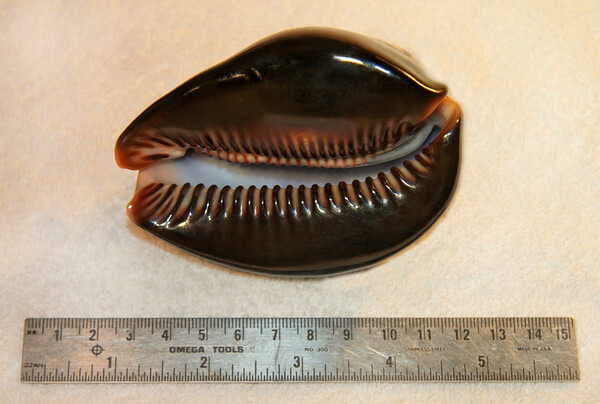 Snakehead Cowrie (Cypraea caputserpentis), ventral view. Collected 2013; Ma'alaea Bay (intertidal zone), Maui County, Hawaii. Locally very common on the reef platform. 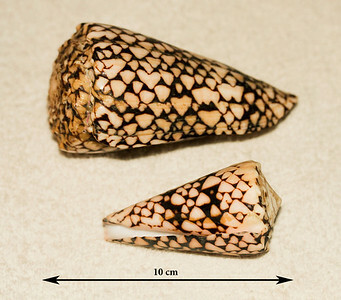 Marbled Cones (Conus marmoreus). Collected 10 April 2011 (larger specimen, abaperatural view) and 2 March 2013 (aperatural view), Ma'alaea Bay (intertidal zone), Maui County, Hawaii. 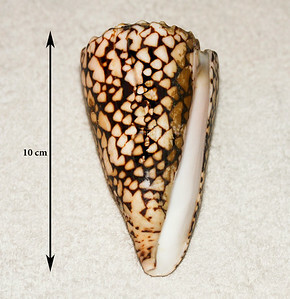 Marbled Cone (Conus marmoreus). Collected 10 April 2011, Ma'alaea Bay (intertidal zone), Maui County, Hawaii. 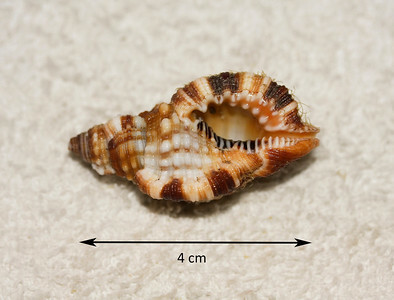 Hebrew Cone (Virroconus ebraeus; synonym: Conus ebreaus), aperatural view. 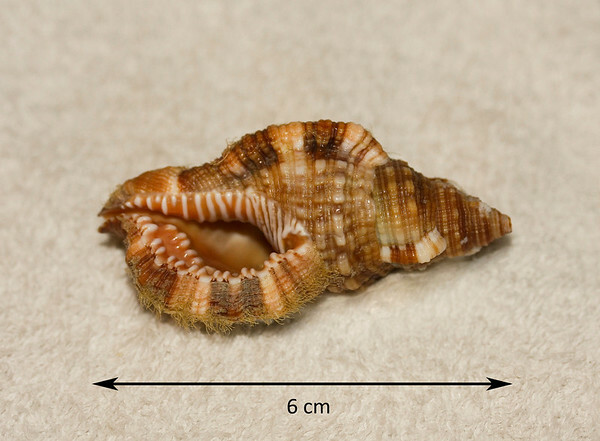 Collected 16 February 2013, Ma'alaea Bay (intertidal zone), Maui County, Hawaii. Hebrew Cones (Virroconus ebraeus; synonyms = Conus ebraeus). Aperatural view. 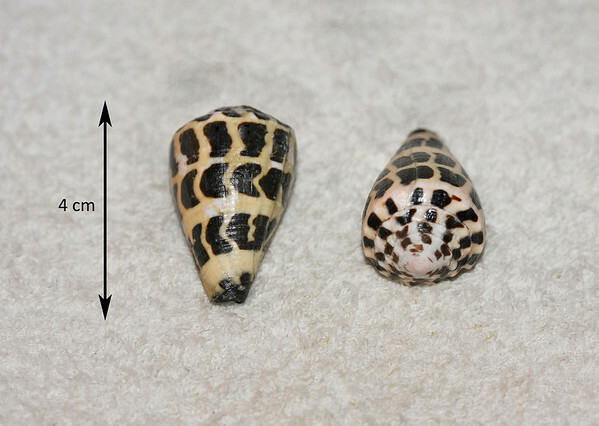 Collected (left to right) 16 February and 21 May 2013, Ma'alaea Bay (intertidal zone, beach sands), Maui County, Hawaii. This species is common throughout the Indo-Pacific region, but it attains its largest size in the Hawaiian Islands. 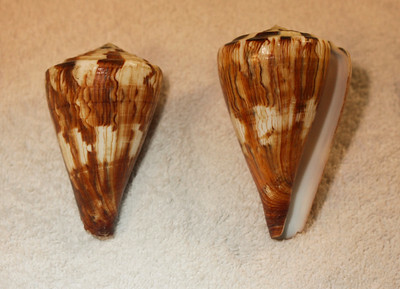 Hebrew Cones (Virroconus ebraeus; synonyms = Conus ebraeus). Aperatural view. 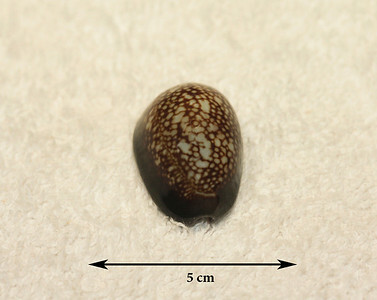 Collected 16 February and 21 May 2013, Ma'alaea Bay (intertidal zone, beach sands), Maui County, Hawaii. This species is common throughout the Indo-Pacific region, but it attains its largest size in the Hawaiian Islands. 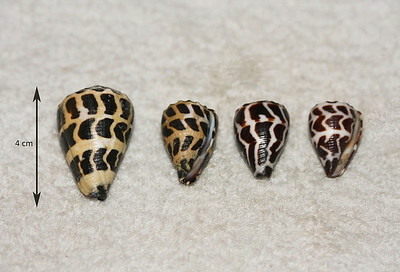 Hebrew Cones (Virroconus ebraeus; synonyms = Conus ebraeus), dispalying variations in size and pattern of coloration. Collected Ma'alaea Bay (intertidal zone), Maui County, Hawaii. Flag Cone (Rhizoconus vexillum; synonyms: Conus vexillum, Conus sumatrensis, C. capitaneus), abaperatural & aperatural views. Collected 22 September 2012 (left) and 0ctober 2010 (right), (intertidal zone), Ma'alaea Bay, Maui County, Hawaii. An uncommon species, usually collected at depths of 50 m or more. 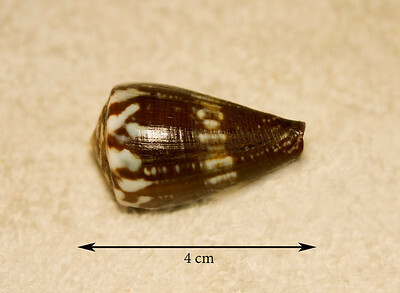 Rat Cone (Rhizoconus rattus; synonym: Conus rattus), abaperatural view. Collected 23 June 2012, Ma'alaea Bay (intertidal zone), Maui County, Hawaii. Flag Cone (Rhizoconus vexillum; synonyms: Conus vexillum, Conus sumatrensis, C. capitaneus), view of spire coloration varieties. 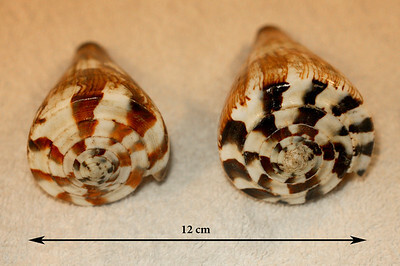 Collected 22 September 2012 (left) and 0ctober 2010 (right), (intertidal zone), Ma'alaea Bay, Maui County, Hawaii. An uncommon species, usually collected at depths of 50 m or more.